Story trails are relatively simple for churches to organise, as they can be run by just one person (plus school staff and volunteers) and do not require much in the way of materials. The children visit a class at a time. The story trail can also be offered after school (or at a weekend) to children's groups and the local community. The story trail itself can be laid out in any part of the church. It consists of about twenty small scenes with words to be read aloud or individually. The children are given organza bags to collect tiny symbols at each scene to remind them of each part of the story and help them retell the story themselves. The session starts with an introductory story. Then the class is divided into three groups. One group follows the story trail while the other two are offered a time for creative response and refreshments. At the end the class is brought back together for a short time of reflection. Christmas trail: A story trail that tells the story of the birth of Jesus from the journey to Bethlehem to the flight into Egypt. 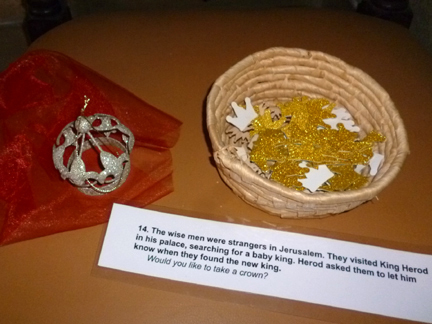 Easter trail: A story trail with symbols to collect to tell the story of Holy Week from Jesus entry into Jerusalem on Palm Sunday to his resurrection on Easter Day.